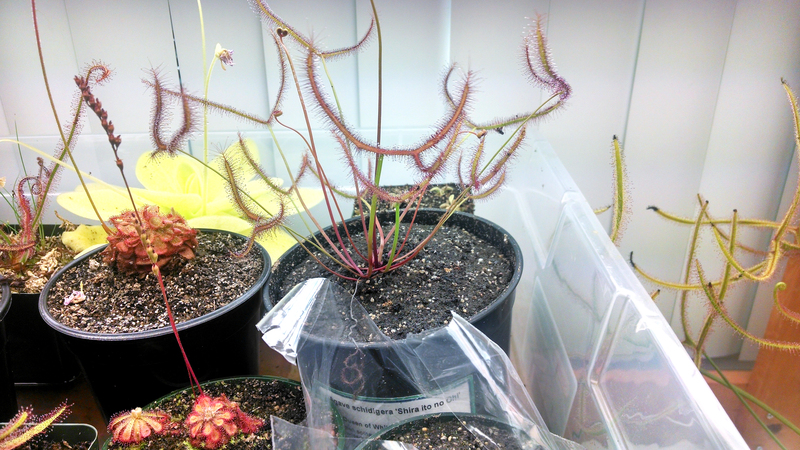 Plant trade update, 2 months later |Sundews Etc. 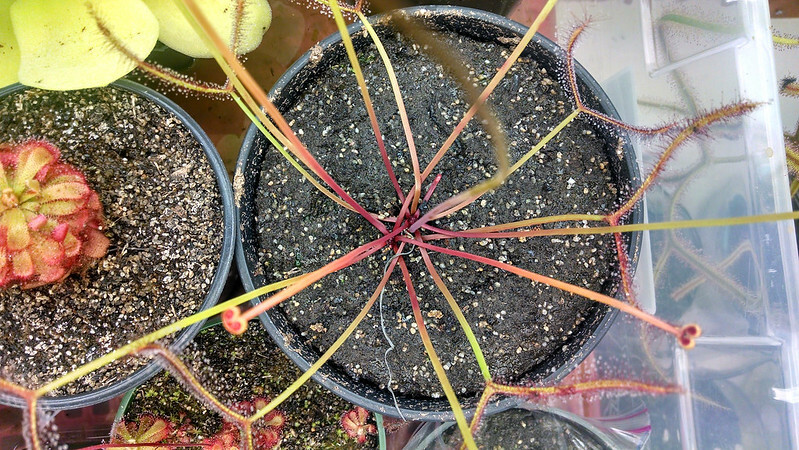 Back in March I set up a trade with a grower in Florida – Drosera capensis, both 'Albino' and typical, as well as some Drosera 'Marston Dragon' root cuttings in exchange for Drosera filiformis Florida All-Red, Drosera binata var. multifida f. extrema, and D. binata dichotoma T-Form. Pretty reasonable all 'round, though the plants, as always, looked terrible when freshly shipped. A week later, however, and they were settling in. It's been just about 2 months since the last update, so let's see how they're doing since then. I gave it lots of room in the pot to get as extreme as it wants. 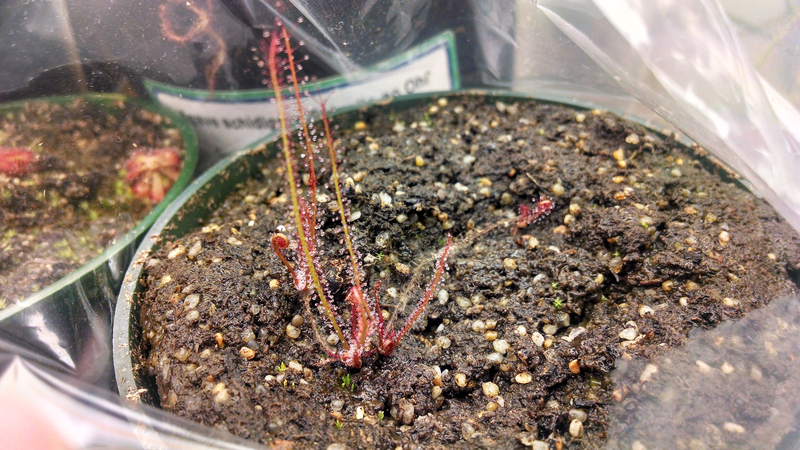 This is Drosera binata var. multifida f. extrema, which I will henceforth refer to as "Extrema," since the full name is cumbersome without even being botanically valid. It's doing great! This is the one that wrapped up blooming a couple weeks ago (no I never cut the stalk, though I'm not sure why not). It's got a bunch of big, dewy leaves, great color, and is generally just an awesome plant. It has even had the kindness to divide itself for me. Check out that color gradient! It's awesome. I suspect that flowering may have led to division (I'm seeing something like that with my Pinguicula gigantea too), and since that business all wrapped there's been some nice new growth forming too. The other D. binata plant I got was implied to be the Dichotoma T-Form, though I'm not 100% positive on the issue, and some of the laminae are split, so I guess I'll just refer to it as an unidentified D. binata clone. The D. binata complex is really vigorous, from all of my experiences. This plant has longer petioles and is more upright generally than the previous one, but is doing just as well. It didn't flower (which I don't mind), but was already 2 or 3 separate plants when I received it. There was also a broken root segment that I buried when potting up the new plants, and in the last 2 weeks or so I think, it's sent up new baby growth. Little tiny guy! It's precious. How cute! And robust! I need to do more D. binata complex root cuttings. 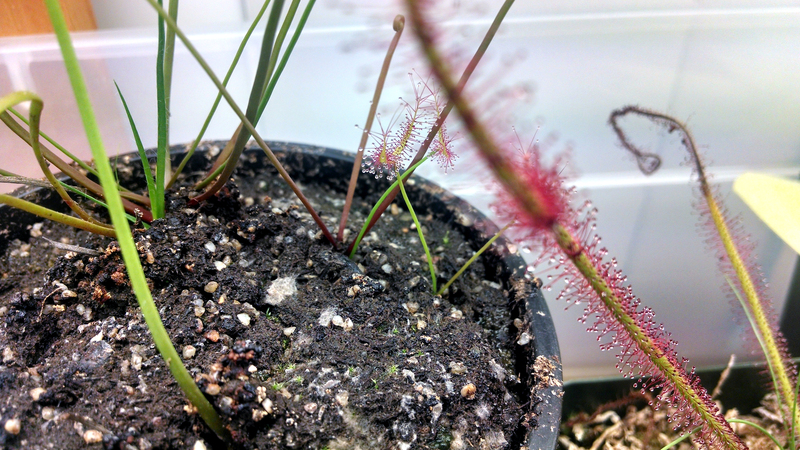 The last plant I received was the one I was most excited about – D. filiformis, the All-Red form from Florida, which is supposed to have very light dormancy requirements. The two plants I received are doing fine, but aren't particularly impressive, especially compared to the D. binata clones. 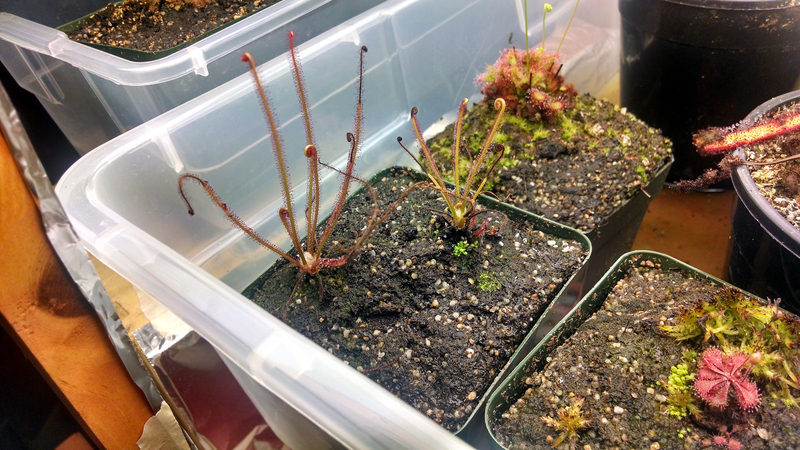 I wish these D. filiformis looked a bit better. I bet it's the humidity. 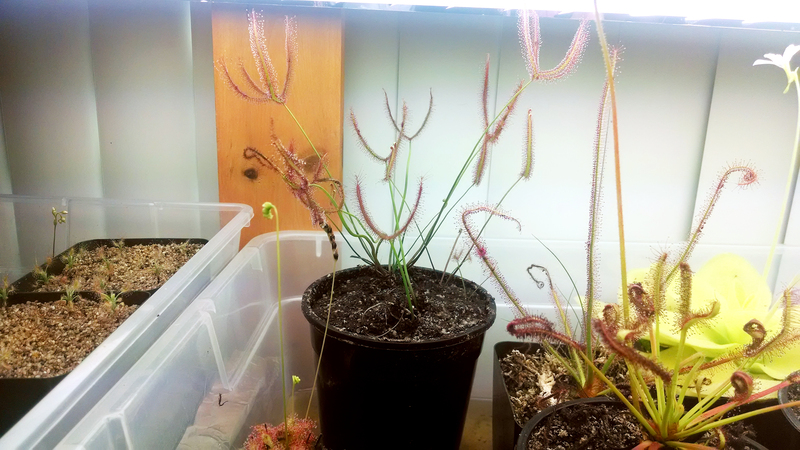 Maybe D. filiformis is just a slower grower. I know these two had much less in the way of roots than the D. binata clones did. They have fairly light dew production, and sometimes the leaves don't even fully unfurl before dying back. Still, they're larger, and hopefully with feeding will continue to size up. The one on the right is producing an offset, which might account for its somewhat slower growth. The smaller plants tend to be really red. 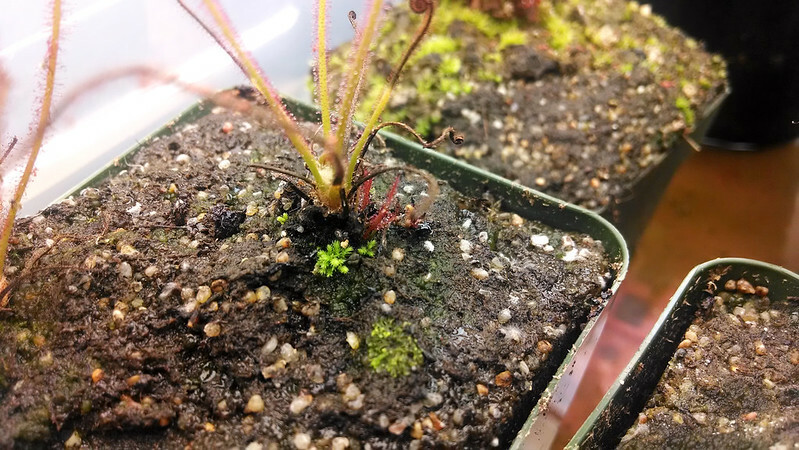 The big bright spot about my D. filiformis is in the leaf cutting that I didn't believe would strike – not only did it strike, but I've got 4 plantlets out of it, the largest of which are more than an inch and a half (4 cm) tall. At least the leaf cuttings are looking good. These seem, relative to their size, more robust than the parent plants. Maybe its the slightly higher humidity – the large plants are in the corner of the tray, which of course has the lowest humidity. Maybe I should try moving them to the other rack, which has higher humidity over all, being a bit enclosed. It's like the plants grow all by themselves!